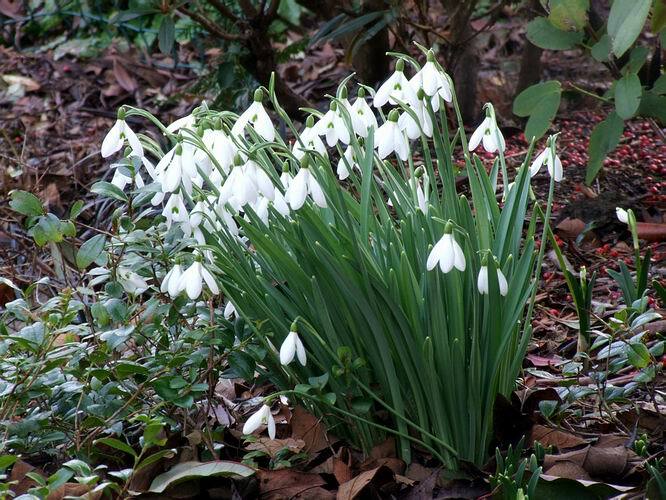 I am greatly amused with the talk in the press of how early all the bulbs are this year. Since starting the bulb log in January 2003 I have a very accurate photographic record of not only exactly when my bulbs came into flower but also what stage they were at week by week. 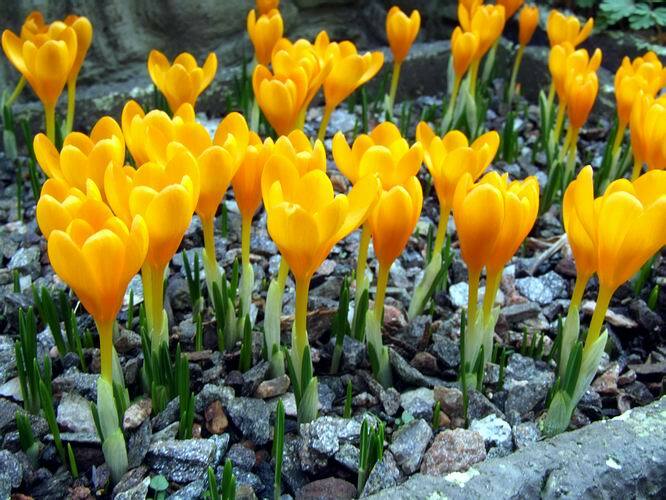 Over that time there has been remarkably little variation of when the bulbs have flowered and this box of Crocus gargaricus is, in fact, a week later than normal. That leads me to another question everyone, myself included, keeps saying this is not a normal season, what exactly is a normal season? We can work out a mean or an average season but there is no such thing as a normal year. 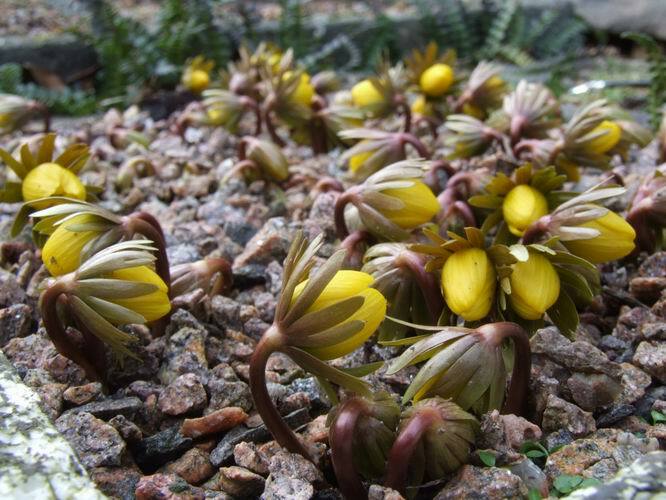 For the last three years I have taken the box of Crocus gargaricus and this one of Eranthis 'Guinea Gold' to the Early Bulb Day in Dunblane (which is always the 3rd Saturday in February) but this year neither was ready in time. 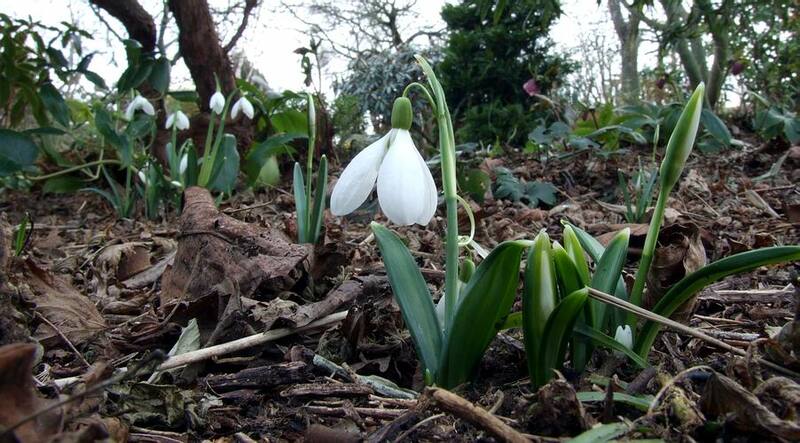 The picture above shows it the week after the Bulb Day. Here it is photographed today, Tuesday 27 February, in the freezing rain: if only we could get a bit of warmth and some sunshine to open the flowers - the forecast is for snow!! All over the garden Iris 'Katharine Hodgkin' is flowering as always, coping well with the worst that the weather can bring. In a few beds there are fewer flowers than normal, (oops, I should say, usual,) so I will have to pay particular attention to giving them a boost of potassium and make sure that it is watered in so it goes down to the bulbs to feed them up for next year. nursery that will lift and send the bulbs out immediately so they are not out of the ground for more than a few days. 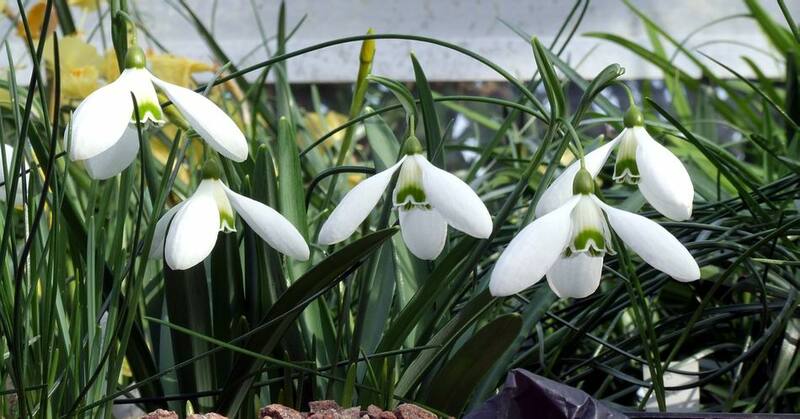 Yes I also admit to growing some galanthus in the bulb house which is especially suited for the Galanthus Mighty Atom group whose flowers are so large that they struggle to hold them up clear of the ground. 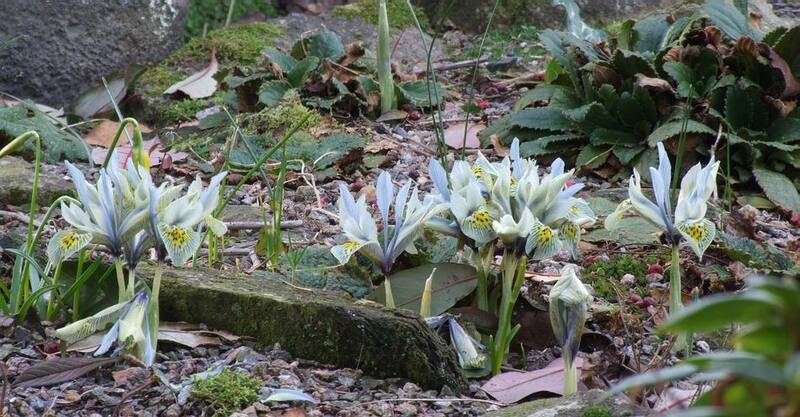 In the garden their flowers touch the ground and when it is wet they get covered in mud. 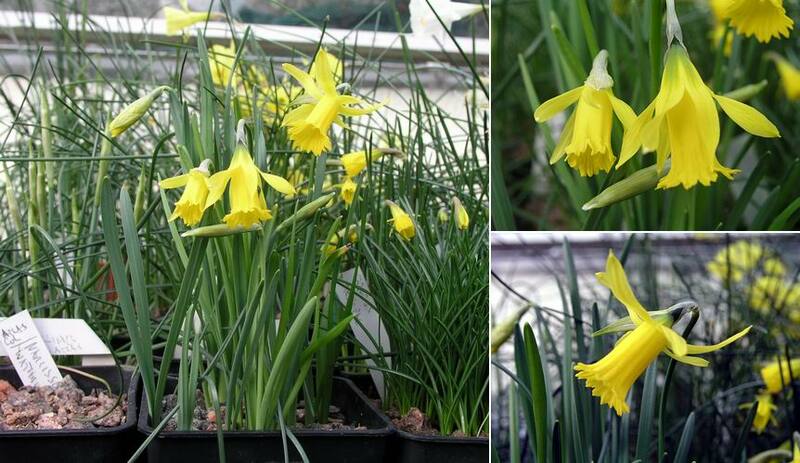 Now then, having had another go at all you galanthophiles I will put on my Narcissus-nurd cap and show you a few narcissus hybrids I have made as they are currently in flower. This is a pot of seedlings most of which are flowering for the first time, the seed parent was Narcissus perez-chiscanoi and the pollen parent N.cyclamineus. Sometimes it is not clear if your crossing has been successful as the off spring can look very similar to the parents and in this group one is definitely a cross, bottom right, while it is not so easy to see the influence of the pollen parent in the others. On the left is a hybrid I made some years ago crossing N. Minicycla, itself a hybrid between cyclamineus and asturiensis, back onto N. cyclamineus. My reason for making this cross is that I do not find Minicycla very robust and I have nearly lost it several times I have never managed to increase it beyond about 6 bulbs. 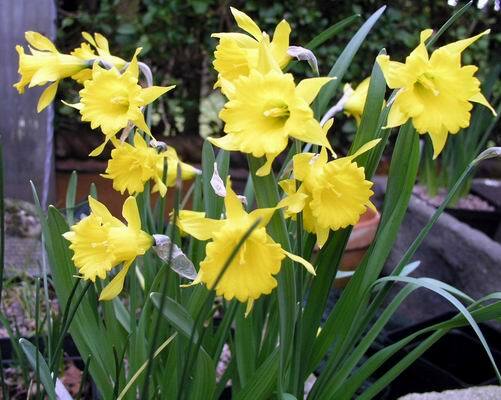 My hybrid is proving much more vigorous and is increasing slowly it may just be that it is a young bulb recently raised from seed as opposed to Minicycla which has been around for a very long time. 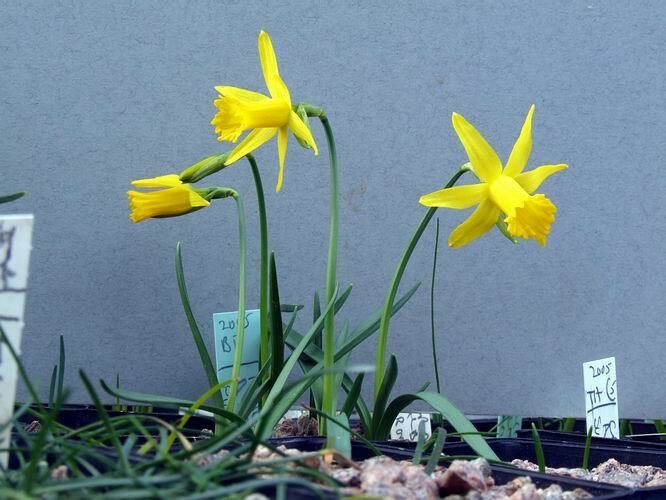 The other parent involved is the tiny Narcissus asturiensis; this form is from the famous Picos de Europa mountains that I watch the Cyclists of Le Tour De France tackle most years at an alarming fast and impressive pace. I have been collecting as many forms of asturiensis as I can in recent years as I just think it is one of the finest of the yellow trumpet daffodils I will show you more of them in the next few bulb logs. 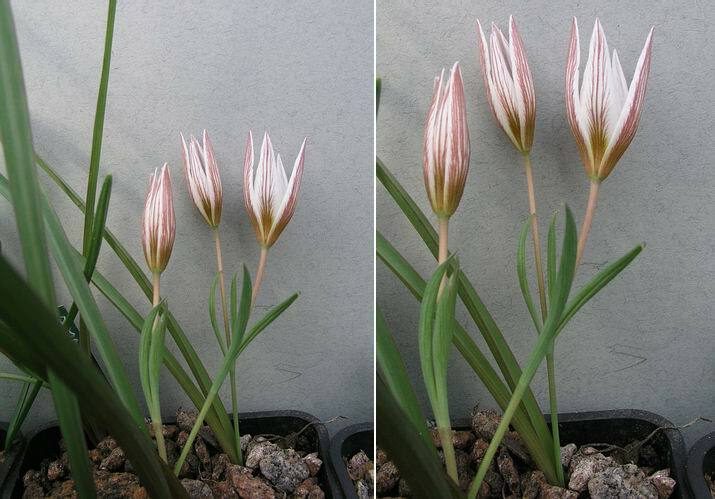 This pretty little bulb has been in and out of the genus Tulipa several times as the botanists change their minds and gather more information on it. It would seem from recent DNA studies that Amana should be retained as a good genus and not treated as a section of tulipa. Amana differs from tulipa in that there are leaf like bracts on the stem below the flower, they also grow much further east in China and Japan. 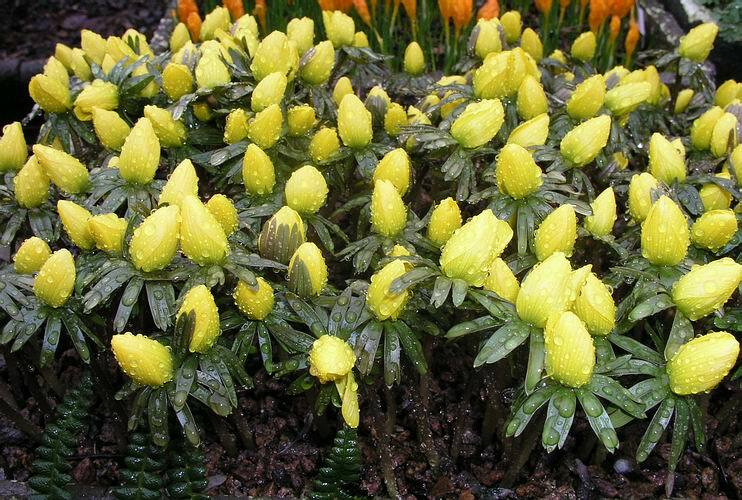 It is not only for its charm as a flower that I am interested in Amana edulis but, along with Tulipa it is very closely related to Erythronium and probably diverged slightly before, or at around the same time, from the Liliaceae family tree. 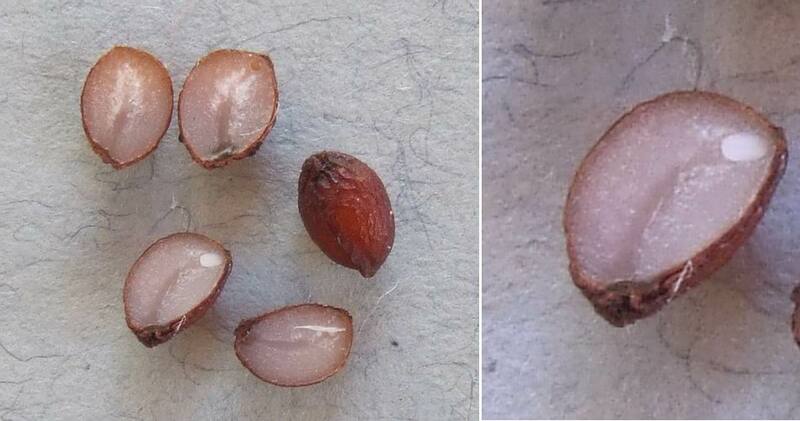 As part of my ongoing study into Erythroniums I have been dissecting seeds and thought you would be interested to see the inside of these seeds where you can see the tiny ovate embryo (bottom left and enlarged on the right) surrounded by the food reserve of starch which will fuel the initial stage of a root and leaf growth until the plant can absorb sustenance from the soil it is growing in. The lower right seed has a miniature leaf shape form and I am not sure if this is the embryo starting to extend or if it is a malformed embryo which will not germinate despite the seed looking healthy and normal from the outside.